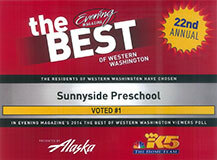 Sunnyside Preschool & Kindergarten is an Award-Winning private school established in 1990 to provide high quality early childhood education for children in a fun, safe environment. 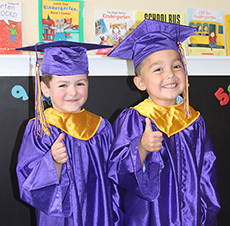 Located in Lake Stevens, WA, Sunnyside has been a model school for the local colleges with an outstanding reputation, attracting a client base that spans throughout Snohomish County. It is through the rich curriculum offered at Sunnyside that abides by the standards of The National Association for the Education of Young Children (NAEYC), that children learn and grown in all areas of development, promoting positive self esteem, building confidence, and encouraging cooperative, caring social interactions based upon mutual respect between their peers, teachers and the community. Each student is met at their own individual level, while being guided, challenged and encouraged to be successful at the next. Our programs get your preschooler active and engaged using a play-based curriculum that promotes all areas of development. Schedule a tour of Sunnyside's facility to see for yourself what everyone loves about Sunnyside's approach to learning, the curriculum, our staff and our awesome, select playground! My daughter is excited to go to preschool every morning. The teachers are excellent as well as nurturing and the facility is very comfortable and stimulating for children. ©2019 Sunnyside Learning. Site by Web Designs by LAO.